Sushi is a type of Japanese food that is characterized as raw or cooked fish with rice, sometimes vegetables, and a seaweed wrap. Served in Japanese restaurants and sushi restaurants, sushi is popular these days in many varieties from California Rolls to tempura-fried cream-cheese filled rolls. Sashimi is also Japanese food but, is typically served as fish without the rice or seaweed. When shopping for fish to make sushi at home, the term sashimi quality means that it is meant to be eaten raw. Fresh and raw fish is sliced into thin pieces and served with dipping sauce. Making sushi at home is a skill that requires practice if you want to make them like the chef at the sushi bar. Remember that while your rolls may not look perfect, buying top-quality ingredients will assure you of a great tasting treat. Find sushi recipes online or at your local Japanese grocery. Assemble your ingredients and make sure you keep cleanliness and safety in mind as you create your first sushi rolls. Sashimi sounds like it is easier to prepare since it is just raw fish, but the creation of the sauces used for dipping take the most time. Be sure to buy sashimi quality fish and avoid fresh-water varieties. Slice the fish with your sharpest knife and cut against the grain. Do not saw the meat! 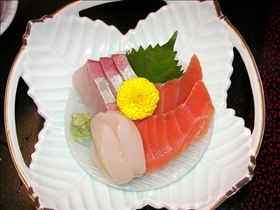 Traditionally, sashimi is served with Saki. The rise of sushi in popularity in Western cultures has risen dramatically in recent years. It is now common to see an offering of sushi at every Chinese buffet-style restaurant. Sushi is available in many varieties that make it easier for some people to become comfortable with the idea of eating raw fish. 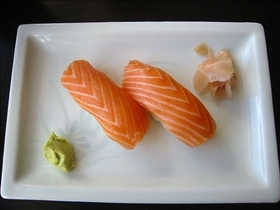 Sashimi is popular in many cultures, but in Western culture, it still takes a backseat to sushi, as the full flavor of the fish is experienced with sashimi. The addition of rice and vegetables in a sushi roll seem to make it more palatable to the new sushi eater, but sashimi is a delicacy to be enjoyed in its own right. The blending of various dipping sauces makes sashimi extremely yummy! Sushi is a Japanese type of food that was historically preserved by fermenting fish in rice that has been soaked in vinegar. The literal meaning of sushi is "it's sour". The sushi that most people are acquainted with today has little resemblance to the traditional offering of sushi. The word sashimi is probably from the type of harvesting done to procure the top quality fish. When hand lined fish is caught, its brain is pierced so that it dies instantly. This makes the amount of lactic acid in the meat very small. Sashimi dates back to the period of Japanese history from the 1300s through the late 1500s. Both sushi and sashimi are cuisine options from Japan. Healthy and delicious, these foods are sometimes confused as the same thing. While sushi and sashimi are both made of top-quality fish, the main distinction is the use of vinegary rice. In addition, sashimi is traditionally eaten raw and sushi can be served with raw, cooked, or braised fish. Fresh Food vs. Canned Food: Which is best?